Each puzzle consists of an NxN grid with some clues along its sides. The object is to place a skyscraper in each square, with a height between 1 and N, so that no two skyscrapers in a row or column have the same number of floors. 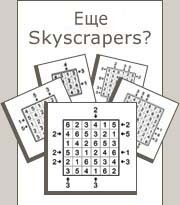 In addition, the number of visible skyscrapers, as viewed from the direction of each clue, is equal to the value of the clue. Note that higher skyscrapers block the view of lower skyscrapers located behind them.